For working with open flame or with catalyst unit in combination with adapters for soldering, hot-cutting, woodburning and shrinking of insulating sleeves. Also for retouching surface imperfections in wood (cracks, dents). Electronic piezo crystal lighter with safe on/off-gas flow switch. Individually controllable gas and air supply. Hard-soldering of delicate parts with flame temperatures up to 1,300 °C. When working with tips up to 500°C. Relatively large gas tank (20ml) for long continuous work. Refillable with standard butane cartridges for lighters. 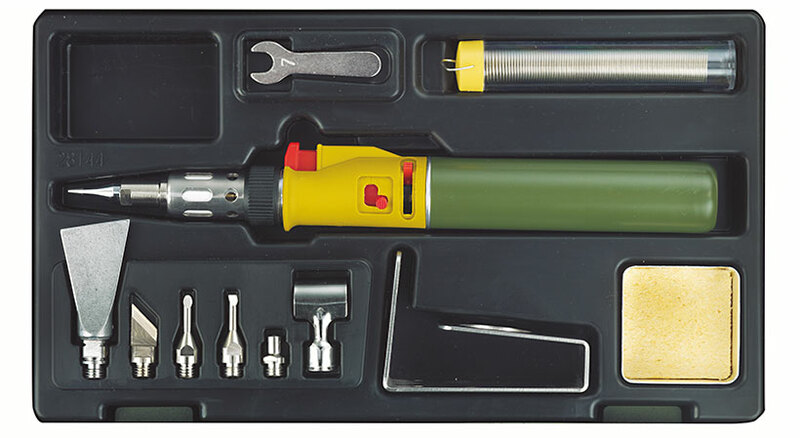 a soldering tip, a round nozzle for hot air work as well as one for heat-shrinking sleeves. Also included: Soldering tin, drip tray with sponge and 7mm open-end spanner for tightening the adapter tips. A practical stainless steel base also enables stationary work. Packed in plastic case with sturdy PP tray. Each piece finds its place! Click the button below to add the Proxxon MICROFLAM gas soldering set MGS to your wish list.